After you've taken the time to find all the leaks in your home you have to get rid of the leaks to make a difference. In most cases this is as simple as sealing the leaks using caulking, weather stripping or spray foam insulation. I typically recommend starting with your ceiling and then working your way down. You will most often notice leaks in your home in the wintertime, as most of us are more sensitive to the cold. These leaks are typically noticed in the form of drafts around doors and windows, but can also show up around plumbing and HVAC ducts to the most sensitive homeowners. 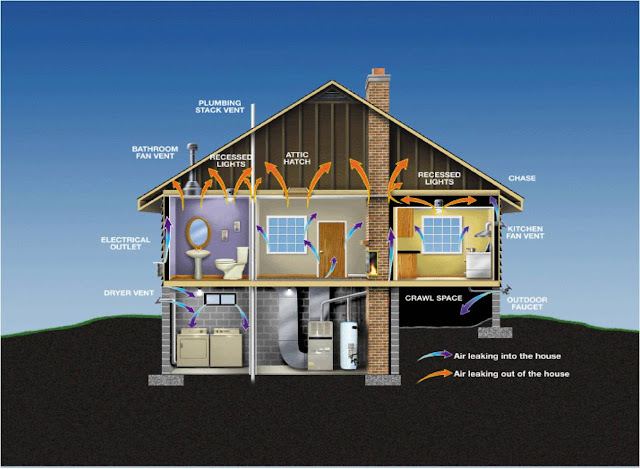 There are several sites in the home in which air can enter, and it doesn’t just enter the home in the winter! So how does a homeowner go about finding these leaks? 1. Feel for the leaks. You can simply feel for the leaks. This may not always be the most efficient method for finding the small leaks, but larger leaks can be found by doing nothing more than running your hand around the area that you suspect to be leaking. This is especially true on days when the temperature outside is drastically different than the inside. 2. Use a wet rags to wet your hand and then feel for the leaks around known locations. I have never personally performed this method and don’t know how useful it actually is, but supposedly the water will help you feel for the temperature changes. Just don’t be fooled by the temperature of the water. 3. Use a candle or other smoke emitting device. This is very similar to what the professionals do. I have seen several items used, including candles, cigarettes, cigars, and incense. With all of these, you must be careful of the burning end of the item - and this may not be the best for indoor air quality. Professionals will often use smoke-emitting devices that are made specifically for this and do not burn. 4. Have a professional find the leaks for you. This may defeat the whole purpose of saving money by performing the task yourself, but you may find it beneficial to have a professional use their blower door to depressurize the home and help you find the leaks. Often, I can find leaks without the use of smoke by just feeling for them. You will find more leaks this way, but again, you must consider the cost. Some professionals will perform just a blower door test without an energy audit for a reduced price. As you can see, most of the most of the leaks come from the basement and attic. These are two great locations to start! Here are some other areas to scan when you are looking for leaks in the home. These are just a few sites, so take a look around and see what you may find. Next week, we'll begin covering how to seal these leak spots. 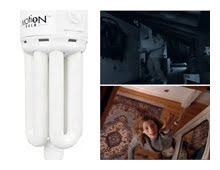 Use timers or motion sensors to turn off lights when not needed. Motion sensors have become a common item on exterior flood lights, but they aren't often used in the home. People tend to leave lights on when they are not in the room; by installing motion sensors or timers in rooms such as the bathroom, storage rooms, garages and closets, you can save money and worry. Sealing air leaks in your home can have the quickest payback of all the energy saving repairs that you do! According to the EPA, you can save up to 20% on your heating and cooling bill (10% of your annual utility bills) by sealing and insulating. Most of the work can be performed by a handy homeowner on a Saturday with some caulk, foam, weather stripping, and sweat. 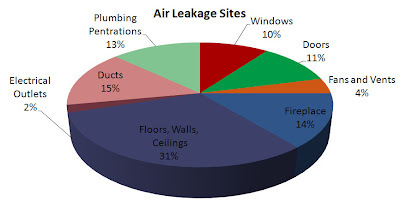 As you can see, the perimeters of your home have the most leaks, and the outlets have the least. To group all these items into a short article would not do them justice, so over the next few weeks I will go over how a homeowner can locate these leaks and correct them. This week, we will go over some of the basic items that you will need to correct these items; in the energy tip of the week, I'll quickly cover what is, in my opinion, the least important but sometimes the easiest to fix: electrical outlets. 1. Spray foam: This comes in convenient cans that make application, while somewhat messy, rather easy. Dow is the manufacturer of the most commonly seen cans. They make three basic types: big gap, regular, and low expansion. Each of these has its application; the directions on the cans are rather self explanatory, but for sake of being thorough in explaining the uses, I will give a brief synopsis. 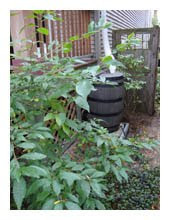 Big Gap: This is used to fill large gaps typically over 1 inch. Regular: This is the basic foam type and will typically be used more than the others. It can be used in most all applications; however, there may be other types better-suited, depending on the use, such as the big gap or low expansion. Low Expansion: This foam does not expand as much as the others and will typically be used in small gaps, especially around windows and doors. Doors and windows are susceptible to sticking as the foam expands and deforms the frame. It helps to prevent this from happening. 2. Caulk: There are 3 basic kinds of caulk, ranging from silicone, a silicone polymer mix, and latex. I recommend silicone, as it lasts longer and is flexible. 3. Backer Rod: This is an item that is used to fill large gaps for caulking when spray foam will not work. Simply insert and caulk over. 5. Foam gaskets: There are several gaskets that can help seal around objects in the home. The majority of them come on trim kits, such as fan covers and recessed light trim kits, but you also have items such as the outlet cover gaskets. These do pay a crucial role; other than using this as a lead-in to sealing outlets, it is worth mentioning because many individuals will forget to install the gasket or will tear it in the installation. As you see the outlets only make up 2% of your total leakage in the home. While this is very small (and I typically recommend these as a last step), they are rather easy to fix - especially if you are building a home. To stop this leak during construction, there are two steps. One is to seal the penetrations in the walls (which I'll cover later), and the other is to seal the penetrations of the wires into the outlet box. You can also use air-tight gaskets around the box. If you have an existing home, you can seal the outlets using the gaskets many are familiar with. However, these will only seal around the outlet and not the outlet holes. 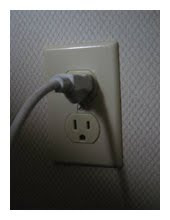 You will typically need to use the child proof covers to totally prevent air leakage into the home through the outlets. While most individuals already know about the programmable thermostats, you'd be surprised how many people either don’t have one or don’t use them. This is one of the easiest things you can do to save money in your home! It's a set-and-forget item with which you rarely ever have to interact. First things first: How much can you save? 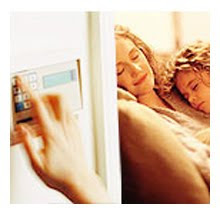 For every 1 degree setback, you can save 3% on your heating and cooling cost. This translates into a 10% savings for every 8-hour setback of 10 degrees, which is a good amount of savings for not doing anything but going to work for 8 hours! 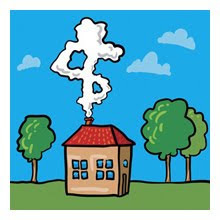 The EPA figures that a standard homeowner will save $180 per year following their guidelines for setbacks. These savings translate into a payback of around 6 months for the installation of a programmable thermostat if you do it yourself. 1. 7-day: If you have different schedules for every day of the week, then this is for you. This type allows for customization for every day. 2. 5+2 day: If you have the same weekday schedule and another for the weekend, then this is your selection. 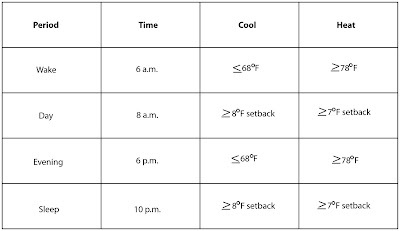 This type allows you to make one setting for the weekdays and another for the weekend. 3. 5+1+1 day: This one works for individuals who have one schedule for the weekdays and another for Saturday and Sunday. You can make one setting for the weekdays and then separate ones for both Saturday and Sunday. This works well for individuals who have activities on the weekends but have set schedules during the week. Now that you have one picked out, how do you install it? You can either have a licensed HVAC technician perform the work, or you can do it yourself. Evaluate your skill level and read the instructions. Most thermostats will only require you to unplug the wires from one unit and reinstall them in the same spots on the new. Remember, this is low voltage, but still turn off your power to the unit. Once it’s in, you need to know how to program it. I typically recommend setting temperatures at 68 F in the winter and 78 F in the summer when you are home, and cut them back as much as possible during the day and at night. Below is an example of a weekday schedule. 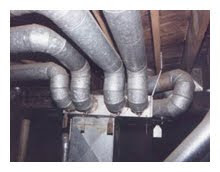 Duct leakage is one of the most costly leaks in the home. Have a professional check your ducts and properly seal them using mastic - not tape. Duct tape was created in WWII to use as a means to keep ammunition cases sealed and dry, not to seal ducts, as many believe. It can become brittle over time and lead to severe leaks. If you have duct tape, get your ducts checked and properly sealed using mastic.